Kyoto is the ideal place to find unique Japanese souvenirs. In this article we introduce some of the shopping spots worth checking out, as well as what kind of souvenirs can be purchased there. Keep your memories of Kyoto with these great souvenirs! Kyoto is a popular sightseeing destination among visitors from Japan and from around the world. 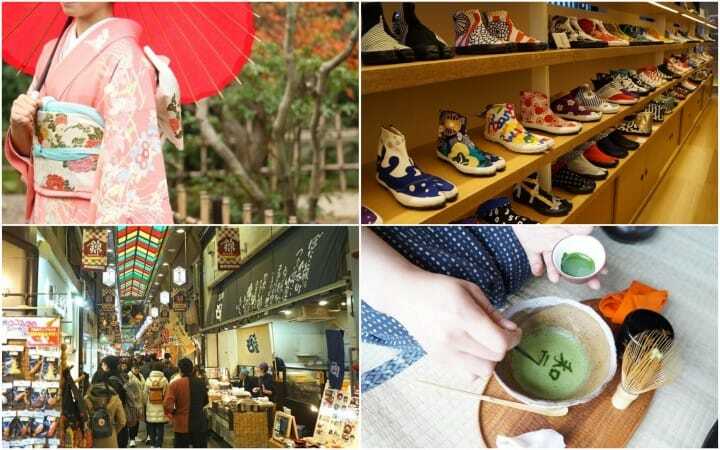 Today we'll be introducing some recommended places and shopping spots for Kyoto-exclusive souvenirs and experiences. Kyoto is known for its many World Heritage Sites and a unique atmosphere. But there are also many places in this wonderful city where visitors can enjoy shopping. This is a shopping street right by the Hankyu Kyoto Line Kawaramachi station or the Tozai Subway Line Shiyakushomae station. Shops that sell washi (Japanese paper) and sensu (fans) line the street. It's a great spot to search for Kyoto-exclusive items. Kyosensu are Kyoto-style fans. They are made only in a few places in Kyoto and Shiga. Each is carefully crafted by skilled craftsmen. Hakuchikudo is a sensu specialty store, where you can find various traditional Kyoto sensu fans. Hidariuma is a long-established cosmetics store founded in 1897. The store offers many cosmetics items such as oil blotting paper. It is said that many of Kyoto's geisha visit the store regulary. Kyukyodo is a long-established washi, or Japanese paper specialty store. Other than letter paper made from washi, also known as binsen, they also sell brushes and other stationery. They have various items with traditional Japanese patterns and designs available. How about using some of the traditional Japanese stationery to express your thoughts of gratitude toward someone special? Nishiki street is a popular spot among visitors to Kyoto, but at the same time it is a shopping street loved by the local people as well. The street stretches about 390 meters and is known as "Kyoto's Kitchen", as you will be able to find various typical Kyoto snacks and ingredients there. Besides groceries and snack, you will also find some rather unique items such as matcha warabimochi. These warabimochi (glutinous rice sweets) are made from fresh matcha prepared at the store. Most normal warabimochi are covered in a light kinako (roasted soybean)powder. These matcha warabimochi offer a great combination of a traditional snack and the "Taste of Kyoto". You will also be able to find numerous variations of edible souvenirs. Items such as individually wrapped snacks, Kyoto pickles and sake can be found and purchased at reasonable prices. Nishiki Market also offers a big variety of Kyoto ceramic and glassware as well as many unique and peculiar souvenirs related to Kyoto. Where to Find the Aromatic Tea of Kyoto? Tea is one of Kyoto's most popular souvenirs. But where is the best place to experience and buy it? There are many shops specializing in Japanese tea in Kyoto, but by far the most famous is Ippodo. We highly recommend stopping by to those who want to try the genuine taste of Japanese tea. If just drinking delicious matcha is not enough, then please head here! Wazukacha Cafe is located in Wazuka, Kyoto. Wazuka is Japan's number one producer of tencha, which is the name of the tea leaves that will become matcha. Visitors can learn how to enjoy matcha, or even how to create some matcha art. It is a great place to enjoy matcha to the fullest and buy some fresh tea as well. Matcha is delicious as it is but some might think its taste is a little too bitter. For the latter category, we recommend enjoying it with some sweets. Gion Tsujiri is an Uji Matcha specialty store established in 1860. They offer not only matcha tea but various Japanese-style sweets as a different way to enjoy the tea leaves. You will be craving more once you've experienced the unique balance between sweet and bitter. Now we'll introduce some stores that offer lovely small accessories, such as tabi socks and sensu fans. Miyawaki Baisenan is said to be a shop that exemplifies Kyoto's history and style. If you want to bring home a genuine and unique Kyosensu fan, this is your first stop. Kungyokudo is an incense specialty store established in 1594. The incenses available here are created mainly from vegetable perfume, and are very popular among Japanese people as well as tourists from other countries. If you wish to purchase a kimono in Kyoto, you might want to consider a reasonably priced antique kimono. Echigoya is a kimono recycle shop where visitors can find beautiful kimonos at very good prices. Owning a real kimono you bought in Kyoto would probably make your trip even more memorable. Sou・Sou - Sneaker-Like Tabi Socks? Sou・Sou is a Japanese clothing store with the concept of "creating a new Japanese culture". Here you will be able to find appealing items with new modern designs that have been inspired by Japanese traditions and patterns. Tokyo To Kyoto: Should You Go Via Shinkansen Or Night Bus?